The style of cartes de visite changed gradually over the second half of the nineteenth century. 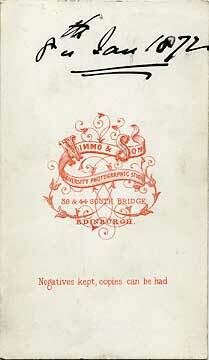 Early examples were on thin white card with square corners and a simple name and address printed on the back. Later examples were on thicker card with rounded corners. Some had elaborate printing and illustrations, often on coloured card. The date ranges refer to the periods when the photographers operated from the appropriate address. They did not necessarily use the style of back shown below through the whole of the period shown. The studio address of the previous photo is 60 Princes Street. This was Howie's studio 1864-67.